Flora was new to the railway when Thomas first met her. Sir Topham Hatt told Thomas to introduce Flora to Toby, as she was to lead an engine parade at Great Waterton with him. Thomas was worried that Toby would be upset that he wasn't the only steam tram on Sodor any more, so Thomas tried to detour Flora until Toby left for Great Waterton. 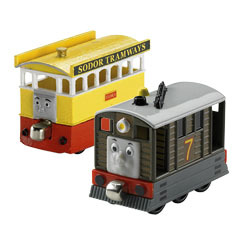 Flora ran out of coal near Toby's shed and Toby saw the bright yellow tram for the first time. To Thomas' surprise, Toby was delighted to see her! Thomas gave Flora his coal and she and Toby went to Great Waterton in time for the parade.